On December 15, 2010 Mark Robison posted a link to a Vegsource review of Whitewash in his blog (Mostly Dogs) with the Reno Gazette-Journal. The posting attracted the attention of the Dairy Council of Nevada. A letter, authored by a Dairy Council dietician, was submitted to Mr. Robison and subsequently posted in the same blog. In the letter, the dietician made an unspecified claim that Whitewash contains “misinformation.” What follows is my response, originally posted in the Reno Gazette-Journal on December 29, 2010. 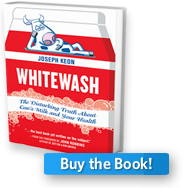 In response to the Dairy Council’s claim that my book Whitewash: The Disturbing Truth About Cow’s Milk and Your Health “… appears to have a considerable amount of misinformation in it,” readers should know that Whitewash cites over 1,200 sources as well as the findings of the United States EPA and USDA. The conclusions made in “Whitewash” are also drawn from the published works of some of the most highly regarded health authorities in America, including Walter Willett, M.D., M.P.H., Dr. P.H.. The Harvard Nurses Study, which included more than seventy-seven thousand women, found women who drank three or more glasses of milk a day had no reduced risk of hip or arm fractures during a twelve-year follow-up period, when com pared with women who drank little or no milk at all. Despite the Dairy Council’s claim of milk safety, the USDA’s Pesticide Data Program (PDP), indicates that milk samples frequently contain residues of toxic pesticides and other contaminants. The largest study of its kind looked at more than twelve thousand children aged nine to fourteen from every state in the nation. It found that the more milk the children drank, the more overweight they were ― even if they followed the current federal recommendation of three daily servings. Obviously cow’s milk was never intended for human consumption, so it’s frivolous to debate its necessity in the human diet. This fact makes it essential that consumers have access to the information contained in Whitewash to help them make truly informed choices. © 2019 Joseph Keon. All Rights Reserved.